An online associate degree in psychology serves as an important first step for individuals who desire to work as psychologists. Earning an associate degree in psychology online gives students an excellent overview of general psychology principles. The Bureau of Labor Statistics (BLS) projects psychology jobs to increase 14% through 2026. Median pay in 2017 hovered around $77,030 for professionals with advanced degrees. Keep reading to learn more about an online associate degree in psychology and what you can expect in this field of study. What Will I Learn in an Online Associate in Psychology Program? A junior college situated in Los Altos Hills in California, Foothill offers an extensive suite of associate degrees delivered fully online. The school’s AA in psychology, which features 90 quarter units, trains learners to eventually pursue positions such as psychiatric aides, mental health workers, and probation officers. The degree requires learners to complete general education credits or the state’s Intersegmental General Education Transfer Curriculum. The program features 35 major-related units, including core courses that introduce learners to psychology, statistics, and research methods. Participants also cover social psychology, positive psychology, child and adolescent development, and abnormal psychology. Learners pursuing an online associate degree in psychology gain access to support services, such as tutoring in math and English, experiential employment opportunities through internships, and career planning. Foothill boasts affordable tuition rates and access to financial aid options, including loans and grants. Foothill holds regional accreditation from the Western Association of Schools and Colleges. Situated in Mississippi, Holmes Community College offers academic, career-focused, and technical educations, as well as dual-enrollment programs on campuses in Goodman, Grenada, and Ridgeland. Holmes Community College also hosts fully online degrees, such as its AA in psychology. This 62-credit degree requires students to complete general education courses in subjects such as history, sociology, and literature. Major-related coursework for this psychology associate degree features the study of child psychology, social problems, human growth and development, and marriage and the family. Completion of an AA degree at Holmes Community College ensures transfer to a four-year college in Mississippi, where learners can pursue further education in psychology or another major. Students in need of academic assistance receive free online tutoring from NetTutor in subjects such as writing and math. Holmes Community College holds regional accreditation from the Southern Association of Colleges and Schools Commission on Colleges. Bucks offers learners in Pennsylvania an affordable education on three campuses. Additionally, through a virtual platform that offers associate degrees, online learners gain access to the same professors and many programs as their on-campus counterparts. The school’s portfolio of 19 online programs includes an AA in psychology track with an interpersonal emphasis. This 63-credit program requires general education in areas such as digital literacy, English, math, and science. Designed for transfer to a four-year college, Bucks' online associate degree in psychology covers topics that include social psychology, human growth and development, and abnormal psychology. Additionally, the school offers a 62-credit AS in neuroscience that students can complete 74% online; this hybrid program also prepares learners for transfer to a four-year college. In addition to general education classes, the degree covers topics such as biological principles, an introduction to psychological statistics, and clinical neuroscience. Bucks holds regional accreditation from the Middle States Commission on Higher Education. Founded in 1993, South Texas College stands as the largest postsecondary college in the U.S. south of San Antonio. The school offers 33 affordable online programs. Its AA in psychology requires 60-61 credits and can serve as the first two years of a baccalaureate degree in psychology. Students who earn this associate degree in psychology online complete general education classes in subjects such as history, math, and physical sciences. The curriculum also requires 18 major-related credits that delve into topics like social psychology, lifespan growth and development, and statistical methods in psychology. Additionally, a learning framework course examines the psychology of learning, helping students use psychological principles to identify their own academic strengths and apply learning strategies to facilitate academic success. South Texas College holds regional accreditation from the Southern Association of Colleges and Schools Commission on Colleges. Located in Texas, OC enrolls 5,500 students in workforce development, career, and technical education, and academic transfer programs. The school also oversees a comprehensive virtual college of associate degrees, including a fully online AA jn psychology, which provides learners with a degree that can be transferred to a four-year program in psychology or another field. The 60-credit degree plan includes general education classes in subjects such as math, U.S. history, and Texas government. Additionally, major coursework covers basic psychology topics, including human sexuality, social psychology, child psychology, and lifespan growth and development. One of the top online colleges for an associate degree in psychology, OC offers affordable tuition and various institutional scholarships. High school graduates and transfer students pay nothing for their first three credits at OC. Furthermore, dual-enrollment students in the county can take six credits at no cost. OC holds regional accreditation from the Southern Association of Colleges and Schools Commission on Colleges. A large Christian school, Virginia-based Liberty enrolls about 100,000 students -- many of whom study online. Liberty Online administers roughly 400 online programs, including its 60-credit AA in psychology. Faculty deliver the AA fully online using eight-week courses, facilitating accelerated degree completion. The program incorporates a strict Christian worldview, preparing graduates for work in the field of human services or further study. The degree plan requires 36-39 credits of general education classes. Students also complete 24 credits related to general psychology, developmental psychology, the psychology of personality, and an intro to research class. One of the best online colleges for an associate degree in psychology, Liberty also mandates that learners complete courses examining theology, Christian life, and biblical worldviews. The school offers e-textbooks at no cost to undergraduates. Liberty holds regional accreditation from the Southern Association of Colleges and Schools Commission on Colleges. Fisher offers affordable education programs on four campuses in Massachusetts and online. The school has served nontraditional students with its accelerated programs for many years. Fisher’s growing portfolio of online degrees now includes an AA in psychology. This 60-61-credit program requires students to study math, English, social sciences, and other general education courses. The major-related coursework of this associate degree in psychology provides learners with a well-rounded introduction to the field. Students study the psychology of learning, human development, abnormal psychology, and the psychology of personality. Upon completion of the degree track, learners can pursue further study in psychology or another social science field. For example, they may choose to transfer their AA credits into Fisher’s BA in psychology program. Online students pay the same tuition, regardless of their residency status. Fisher holds regional accreditation from the New England Association of Schools and Colleges. Established in 1958, Florida Tech maintains a strong online college that offers degrees in various disciplines. The school’s fully online, 61-credit AA in applied psychology blends coursework in the liberal arts and psychology, providing theoretical knowledge that learners can apply to practical contexts. General education courses include the study of history, literature, and computer literacy. Students delve into psychology courses by examining topics such as human sexuality, social psychology, and psychology of personality. In addition to fostering learners' personal development, this degree plan develops students' critical thinking and research skills. Those who earn an online associate degree in psychology can pursue entry-level careers as benefits coordinators and addiction rehabilitation assistants. Alternatively, graduates seeking to further their education can enroll in Florida Tech’s online bachelor’s program in psychology, which offers a suite of specializations. Florida Tech holds regional accreditation from the Southern Association of Colleges and Schools Commission on Colleges. Located in Kansas, BCC provides face-to-face courses on several campuses. Additionally, about 40% of its students study through BARTonline -- the school’s virtual college. Distance learners can pursue the school’s 64-credit AS with a psychology emphasis. Faculty designed the curriculum of this degree track to be readily transferable, providing learners with the first two years of a four-year program in psychology or psychology education. The curriculum of this psychology associate degree includes general education classes in subjects such as math, English, and public speaking. Additionally, major-related coursework covers topics like developmental psychology, abnormal psychology, human sexuality, and social psychology. Distance learners in need of academic assistance can access free tutoring in various subjects through Tutor.com. Students pay one affordable online tuition rate, regardless of their in-state or out-of-state residency status. Designated a military friendly school, BCC also offers special services and programs to military personnel and their families. BCC holds regional accreditation from the Higher Learning Commission. One of Maryland’s top community colleges, AACC enrolls 50,000 students and offers 225 programs of study. The school’s 60-credit AA in psychology can be completed online and requires 31-36 credits of general education classes in areas such as arts and the humanities, computer technology, and biological and physical sciences. Students complete additional credits in their major, examining developmental psychology, abnormal psychology, and career development and assessment. Learners also choose elective coursework from a suite of options, including classes in child psychology, social psychology, and the psychology of women. Additionally, a notable course not often available to students pursuing an online associate degree in psychology examines sports psychology. This class delves into current psychological theories and research related to the psychological aspects of success in competitive and recreational sports. The school also offers affordable tuition and awards prior learning credits based on work, military, and other experiences. AACC holds regional accreditation from the Middle States Commission on Higher Education. A faith-based learning community in Texas, SAGU offers Bible-based education and training for various vocations. The school also hosts several fully online programs, including an AS in psychology. This program’s curriculum includes the study of general education subjects, such as American literature, behavioral sciences, and biblical studies. Students examine elementary psychology education with coursework in counseling, developmental psychology, theories of personality, and psychology of selfhood and the Christian faith. The online associate degree in psychology offers small class sizes to facilitate personalized learning. Learners can upgrade their credentials and skills by going on to pursue fully online baccalaureate degrees in human services, majoring in psychology or counseling. Online learners at SAGU benefit from a 15% tuition grant. Students can also access the school’s career center for job training assistance. SAGU holds regional accreditation from the Southern Association of Colleges and Schools. The smallest community college in Iowa, NCC offers a pre-professional associate degree with nine areas of specialization. Its 60-credit AA with a pre-professional emphasis in psychology provides learners with an online curriculum where participants complete 45 credits of general education in areas such as communication, the humanities, and social sciences. The program’s core courses examine various stages of human development and social dynamics, covering topics such as developmental, abnormal, and social psychology. This online associate degree in psychology offers learners part-time and full-time enrollment options, delivering personalized learning in classrooms with a 13-to-1 student-to-faculty ratio. NCC holds articulation agreements with several four-year schools, including the University of Iowa, Iowa State University, and Northwestern College, enabling graduates to go on and pursue a bachelor’s degree. Online learners pay the same tuition rate, regardless of their in-state or out-of-state residency status. NCC holds regional accreditation from the Higher Learning Commission. GMC specializes in delivering character-based postsecondary education. The school, which oversees 15 campuses throughout the state, also operates a virtual college that enrolls 4,000 students who study exclusively online. GMC hosts all of its associate degree tracks entirely online, including AA and AS degrees in psychology. Students in the AA track complete 95-99 quarter credits, while learners in the AS track complete 90-95. Both degree plans require general education in subjects such as English, math, and history. Core psychology coursework features 25-26 credits that examine topics such as human growth and development, the psychology of adjustment, and abnormal psychology. Students pursuing an online associate degree in psychology can also enroll in a research methods course that evaluates diverse research methodologies in behavioral sciences. Students learn to design and conduct experimental and nonexperimental research. In addition to affordable tuition, the school does not charge out-of-state tuition rates. GMC holds regional accreditation from the Southern Association of Colleges and Schools Commission on Colleges. Established in 1986, Missouri-based SCC specializes in college transfer and career preparation programs. SCC’s online campus hosts 16 online degrees and certificates and more than 100 courses. 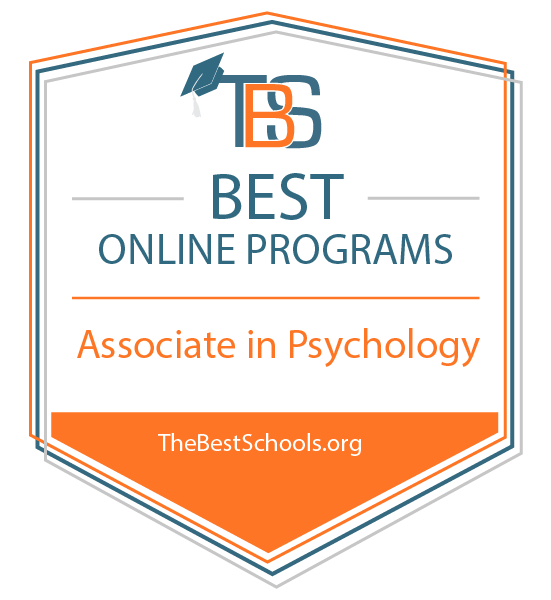 Students can complete 73% of the school’s 64-credit AA in psychology online. The hybrid curriculum includes 42 credits of general education subjects such as English, math, and oral communication. Major-related classes explore topics such as child psychology, adolescent psychology, personality theories, and brain and behavior. Though not required, students may use electives to examine the psychology of aging or applied behavioral analysis. The school’s tutoring center offers in-person and online tutoring in English, writing, and other subjects. In addition to affordable tuition, SCC offers institutional financial aid packages, including full and partial scholarships awarded based on need, academic performance, and program of study. SCC holds regional accreditation from the Higher Learning Commission. Maryland’s first community college, HCC offers more than 100 programs, including some designed specifically for transfer. The school’s 60-credit AA with a concentration in psychology -- a transfer-ready curriculum -- requires 31-32 credits of general education coursework, covering subjects such as English, math, and sociology. Students select concentration classes from several options, such as abnormal psychology, developmental psychology, and social psychology. A theories of personality course evaluates theoretic models, such as behavioral, psychoanalytic, and humanistic theories, teaching participants to better understand human behavior in practical settings. HCC students interested in the research aspect of psychology can learn about different research designs used by psychologists to measure phenomena of interest. Students further broaden their education by taking 17 credits of electives, studying subjects such as anthropology, human services, and economics. HCC holds regional accreditation from the Middle States Association of Colleges and Schools. Allen offers programs on campuses in Iola and Burlingame, Kansas. The school’s online programming includes an AA with an emphasis in psychology. Students complete general education in subjects such as algebra, sociology, and women’s studies. They use elective coureworkwork to complete their emphasis, studying topics like developmental psychology, abnormal psychology, and the psychology of human sexuality. This online associate degree in psychology lays the groundwork for further study in psychology or other fields, such as counseling or human services. For example, students can enroll in a 2+2 program, where students can seamlessly transfer their degree to earn a fully online BS in interdisciplinary social science at Kansas State University’s Global Campus. One of the most affordable colleges in Kansas, Allen charges no out-of-state tuition rates to online learners. Furthermore, students can save more money by participating in the school’s textbook rental program. Allen holds regional accreditation from the Higher Learning Commission. One of the fastest growing colleges in Nevada, TMCC enrolls 25,000 students who study on campuses across northern Nevada. The school also hosts a popular web-based college where distance learners can choose several fully online, asynchronous associate degree tracks. Among these programs is TMCC’s AA in psychology. Participants of this 60-credit program take general education classes in subjects such as English, college math, and a foreign language. The psychology emphasis features 12 credits of classes, covering general psychology, child psychology, abnormal psychology, and research methods. This online associate degree in psychology also includes several elective classes that students can use to strengthen their knowledge of psychology or learn about other subjects. Learners planning to transfer to the University of Nevada, Reno and pursue a BA in psychology/research specialization must also complete courses in social psychology and statistical methods. TMCC offers special tuition rates for distance learners who study exclusively online. TMCC holds regional accreditation from the Northwest Commission on Colleges and Universities. Located in Wyoming, Casper enrolls 3,700 students on its 200-acre campus. The school offers 140 programs, including fully online and hybrid degrees. The school’s 60-credit AS in psychology requires 32 credits of general education in subjects such as biology, pre-calculus, and human behavior. Faculty also enhance learners' problem-solving skills with a course that delves into financial mathematics, logic, probability, and statistics. The major covers psychology at a deeper level than many two-year programs, devoting 29 credits to the subject. Students earning this associate degree in psychology online study general psychology, research psychological methods, abnormal psychology, and developmental psychology. A course on drugs and behavior emphasizes psychotherapeutic drugs' potential for abuse. Another course -- biological psychology -- surveys the biological basis of behavior, including behavioral genetics, psychobiological development, and physiological and sensory mechanisms. Casper holds regional accreditation from the Higher Learning Commission. Located in New Jersey, Brookdale Community College offers 75 associate degrees. The school’s 60-61-credit AA in social science with an option in psychology can be completed online and requires 45-48 credits of general education coursework in classes such as history, math, and science. The degree also requires nine credits of career studies in psychology, covering an introduction to psychology, lifespan development, and quantitative social science research. Learners pursuing an online associate degree in psychology augment their studies by choosing from a suite of psychology courses on topics that include theories of personality, abnormal psychology, and a quantitative methods lab. Coursework also covers positive psychology and industrial/organizational psychology -- subjects not often offered to learners earning associate degrees in psychology. Brookdale Community College holds regional accreditation from the Middle States Association of Colleges and Schools. Montco serves learners in Pennsylvania through programs on campuses in Blue Bell and Pottstown. The school also hosts popular online programming. Montco’s 63-credit AS in psychology incorporates online courses in the liberal arts, social sciences, and psychology, preparing students to transfer to a four-year program. The general education curriculum also covers English, math, and technological fluency. Major-related requirements for this online associate degree in psychology include classes in human development, an introduction to psychology, abnormal psychology, and research methods in psychology. Students can complete this fully online program on a full-time or part-time basis. The school offers affordable tuition, payment plans, and financial aid options, including scholarships. Students seeking to transfer from Montco benefit from the school’s many partnerships with four-year colleges. Montco holds regional accreditation from the Middle States Association of Colleges and Schools. Massachusetts' largest junior college, BHCC enrolls about 19,000 students. The school maintains a strong presence in the state with campuses in Chelsea and Charlestown, in addition to several satellite locations. Learners planning to earn an online degree can pursue the school’s AA with a concentration in psychology. This 62-63-credit degree track includes general education courses in college writing, world views, science and technology, and quantitative thought. The associate degree in psychology at BHCC offers several courses that students can use to fulfill concentration-related requirements, including principles of psychology, social psychology, adolescent and adult development, and an introduction to behavioral research. Learners leave the program with a sound foundation and the ability to apply psychological principles to diverse cultural contexts. The school offers affordable tuition, and out-of-state learners may receive in-state tuition as part of the New England Board of Higher Education’s Regional Student Program. BHCC holds regional accreditation from the New England Association of Schools and Colleges. Cochise enrolls more than 11,000 learners through programs on two campuses and five learning centers in Arizona. Cochise also operates one of the top virtual colleges in the nation, hosting about 2,500 online learners. The school’s fully online AA in social and behavioral sciences offers an emphasis in psychology. Students complete a total of 64 credits, including 35 general education credits in subjects such as math and composition. The program also requires a social science core that delves into topics such as the history of the U.S. and American national government. The emphasis of this psychology associate degree consists of nine credits, which cover statistics, research methods, and developmental psychology. Learners at Cochise also gain access to internship opportunities at national businesses in fields such as healthcare. The school facilitates the seamless transfer of credits through transfer agreements with colleges in the state and elsewhere. Cochise holds regional accreditation from the Higher Learning Commission. A private college in Springfield, Missouri, DU offers 70 majors to 3,300 students, more than half of whom take advantage of evening and online programming. The school’s AS in psychology --accessible to distance learners -- requires general education in subjects such as algebra, earth science, and desktop applications. The concentration core of this online associate degree in psychology consists of 21 credits, covering topics such as lifespan development, social psychology, drugs and behavior, and research methods for the behavioral sciences. Additionally, a course on stress management provides a comprehensive approach to stress reduction to enhance students' well-being. Learners also complete a course on statistics for behavioral sciences, which examines statistical techniques used by behavioral researchers to analyze data. Students at DU learn in classrooms with a 13-to-1 student-to-faculty ratio. The school charges all online learners the same tuition, regardless of their in-state or out-of-state residency status. DU holds regional accreditation from the Higher Learning Commission. Located in Dayton, Ohio, Sinclair offers 240 programs on four campuses. Additionally, the school’s virtual arm administers a catalog of 14 fully online associate degrees. Learners interested in the behavioral sciences can enroll in the school’s AA in psychology program, which prepares them to pursue four-year degrees or entry-level careers at community service, education, and mental health organizations. The curriculum gives participants a well-rounded foundation through general education classes focused on subjects such as English and math, as well as modules centering on the arts and the humanities. Core courses of this online associate degree in psychology cover personality psychology, social psychology, abnormal psychology, and lifespan and human development. The AA degree track meets all of the requirements of the Ohio Transfer Module, which guarantees transfer to a public college in the state. The school offers one of the lowest tuitions in the Ohio and charges all online learners in-state tuition. Sinclair holds regional accreditation from the Higher Learning Commission. MCC enrolls 13,000 students on two campuses in Rochester, New York. The school also hosts online programming, offering more than 200 distance courses. Psychology represents one of the top three majors at MCC, and learners generally enroll in the AS in psychology track, which lays the foundation for a four-year degree. This program can be completed entirely online and consists of 60 credits, including general education courses in writing, anthropology, history, and health and wellness. MCC’s online associate degree in psychology requires participants to study social psychology, abnormal psychology, and developmental psychology in one of three areas: lifespan, child, or adolescence. Learners also receive an introduction to statistics and research methodologies in social sciences. This degree track prepares learners for transfer to four-year schools, such as the University of Rochester, Cornell University, and State University of New York (SUNY) schools. MCC offers more than 300 institutional scholarships and financial aid options. MCC holds regional accreditation from the Middle States Commission on Higher Education. Founded in 1922, CC enrolls 4,500 students on its main campus in Arkansas City, Kansas, at three other academic centers, and through a virtual college. The school’s online programs include its 63-credit AA in psychology, which prepares learners to go on and pursue a baccalaureate degree in psychology. The program’s general education courses include algebra, composition, biology, and public speaking. Core classes examine general and developmental psychology. A course in cognitive psychology examines the human mind and the various phenomena that cognitive psychologists investigate, while a class in biological psychology investigates the nervous system and its functional properties, psychobiological development, and behavioral genetics. Learners pursuing this online associate degree in psychology gain access to free online tutoring in English, math, and computer applications. The school awards hundreds of scholarships each year based on academic achievement and need. CC holds regional accreditation from the Higher Learning Commission. With a 20-year history of delivering hybrid and fully online programs, MXCC sntands as a leader in distance learning. The college -- located in Bedford, Massachusetts -- administers an online AA in liberal arts and sciences with a concentration in psychology. Faculty designed this 61-63-credit curriculum with transfer students in mind. Required general education courses include English, statistics, and sociology, while the concentration examines scientific theories and the practical applications of research in psychology. The program also requires students to complete 12 elective credits, such as human sexuality; child psychology; and brain, mind, and behavior. Additional psychology electives include community psychology and positive psychology. A research methods in behavioral sciences course serves as a capstone and introduces participants to basic research designs, sampling procedures, different ways to interpret data, and ethical issues in research. MXCC holds regional accreditation from the New England Association of Schools and Colleges. Established in 1948, ACC enrolls about 5,600 students on its campus in southeast Texas. The school’s 60-credit AA in psychology -- which can be completed entirely online -- provides learners with the general education requirements and foundational knowledge needed to transfer to a four-year college. General education classes cover English, American history, and the federal and Texas governments. In major-related courses, students delve into the relationship between the brain, behavior, and environment by examining lifespan growth and development, social psychology, and statistical methods in psychology. Electives provide learners with the opportunity to acquire further knowledge in subjects like human sexuality and the psychology of adjustment. This online associate degree in psychology offers a co-op/internship component, in which learners acquire hands-on skills at a relevant organization. ACC also offers affordable tuition, and distance learners receive access to free online tutoring. ACC holds regional accreditation from the Southern Association of Colleges and Schools Commission on Colleges. For 90 years, Butler has served the south-central Kansas community. The school operates eight campuses, as well as a virtual campus that enrolls learners from around the country. Comprised of 63-67 credits, Butler’s associate in general studies in liberal arts provides a customizable degree plan that includes general education classes and courses in psychology. Students learn about algebra, history, and English composition, and they concentrate in psychology by choosing electives such as child psychology, developmental psychology, and marriage and family. Butler’s transfer curriculum offers courses compatible to psychology in cultural anthropology and social and behavioral sciences. A partnership between Butler and Ottawa University gives online learners reduced tuition at Ottawa. Students who earn an online associate degree in psychology can transfer up to 80 credits toward a bachelor’s degree Ottawa. Butler holds regional accreditation from the Higher Learning Commission. LCCC serves learners in Pennsylvania by hosting classes at its main campus in Schnecksville and several other locations. The school also boasts online programming, including an AS in psychology. This degree requires students to complete 60-62 credits, preparing graduates for further study in psychology. Participants examine various applications of psychological principles in practical contexts. The general education component of LCCC’s online associate degree in psychology includes classes in English, college algebra, writing, and a recommended two-semester world language sequence for students planning to transfer to a four-year program. Major-related curriculum focuses on topics such as human growth and development, abnormal psychology, social psychology, and research methods in psychology. Applicants to LCCC join a growing number of virtual learners who earn their degrees online, asynchronously, and affordably. Distance learners gain access to free tutoring from Smarthinking -- available in many subject areas -- as well as disability support services. LCCC holds regional accreditation from the Middle States Commission on Higher Education. Northwest Mississippi Community College offers programs on five campuses, including a pathways program leading to an AA that can be transferred to any four-year public college in the state. The school’s AA in psychology includes a fully online curriculum that gives learners a liberal arts background and foundational knowledge in psychology. This online associate degree in psychology requires students to earn 63 credits and includes general education classes in English, college algebra, biology, and physical science. Students use electives to delve into general psychology, child psychology, and marriage and family. Online learners gain access to various resources, such as tutoring and the EBSCO eBook Collection, which contains more than 45,000 titles covering various subjects, including the social and behavioral sciences. Northwest Mississippi Community College holds regional accreditation from the Southern Association of Colleges and Schools Commission on Colleges. For more than 50 years, Parkland has served learners on its campus in Champaign, Illinois. Additionally, virtual learners can pursue the school’s online AA in psychology to "unravel the mysteries of the mind" while also acquiring a general education foundation. The general education curriculum of this 60-credit degree includes classes in math, communication, and physical and life sciences. The program features nine core psychology credits in topics such as adolescent psychology, child psychology, psychology of personality, and/or human growth and development. Learners interested in applying psychological science in a business environment can take a course in industrial and organizational psychology. Students also gain access to faculty and peer tutoring in general education subjects such as math, biology, and Spanish. Learners earning an associate degree in psychology enjoy small class sizes and affordable tuition rates. Parkland holds regional accreditation from the Higher Learning Commission. One of five colleges in the Alamo Colleges District, PAC primarily serves learners in San Antonio, Texas, and the surrounding communities. Additionally, distance learners can access many of the school’s affordable offerings, including its AA in psychology track. This 60-credit degree plan contains a general education core, covering subjects such as math, American history, and language arts. Students use 18 credits of electives to focus on psychology, studying topics such as general psychology, child psychology, and human sexuality. Additionally, a course on social psychology examines human behavior within a social environment, covering topics such as the socio-psychological process, interpersonal relations, and attitude formation and change. Learners pursuing a psychology associate degree online receive comprehensive support should they choose to transfer to one of several four-year schools in the state. Students can also access tutoring through the school’s learning center. The college offers a comprehensive suite of financial aid, including institutional scholarships. PAC holds regional accreditation from the Southern Association of Colleges and Schools Commission on Colleges. Bergen Community College operates three campuses in New Jersey. The school also extends its reach by offering programming to learners outside of Bergen County through several online associate degree tracks. The 64-66-credit AA in psychology in liberal arts with a psychology option prepares learners for the junior and senior years of a baccalaureate program. In addition to general education classes in subjects such as literature, history, and public speaking, learners cultivate essential critical thinking and writing skills. This psychology associate degree covers the psychology of sexuality, the psychology of women, and the changing roles of women. A Success 101 course helps students develop the skills and habits necessary to succeed in college, emphasizing the importance of setting goals, time management, and study skills. Students who earn an AA from a community college in New Jersey can transfer to many four-year colleges in the state. Bergen Community College holds regional accreditation from the Middle States Commission on Higher Education. One of the largest community colleges in Texas, TJC offers 130 degrees on several campuses and online. The school’s 60-credit AA in psychology delves into the mind and human behavior through a fully online, asynchronous curriculum. The program requires students to complete the 44-credit TJC core curriculum, which includes general education coursework in algebra, biology, world literature, and art appreciation. Students who earn this associate degree in psychology online use 16 credits to examine psychology topics, such as lifespan growth and development, social psychology, marriage and family, and drug use and abuse. Online learners enjoy access to free peer and professional tutoring in math, writing, and biology. Additionally, interactive workshops help learners develop effective reading comprehension skills. The school offers affordable tuition, pay-as-you-go installment plans, and financial aid. TJC holds regional accreditation from the Southern Association of Colleges and Schools Commission on Colleges. Located in Pittsburgh, Pennsylvania, CCAC offers 40 fully online and hybrid degrees. The school’s 60-63-credit AA in psychology, which can be completed online, offers a transferable curriculum that provides students with a broad general education and major-related knowledge. In addition to psychology classes, students study English, history, math and other subjects in the liberal arts and sciences. Individuals pursuing an online associate degree in psychology take classes covering lifespan and development, abnormal psychology, and research methods and application. Additionally, a course on statistics for behavioral and social science introduces students to the descriptive and inferential statistics used by researchers in the field. This course covers topics including variability and distributions and hypothesis testing and sampling. CCAC facilitates learners' transfer to baccalaureate programs through articulation agreements with 29 colleges in Pennsylvania. CCAC holds regional accreditation from the Middle States Commission on Higher Education. Situated in northern New Jersey, Sussex is a small school with one of the highest graduation rates for two-year colleges in the state. The college offers a select number of online degrees, including an AA in liberal arts with a psychology specialization. This 65-67-credit degree plan cultivates students' self-understanding, critical thinking skills, and global awareness. Learners complete general education in topics such as math, English composition, and science. Faculty introduce learners to psychology by studying theories of personality, psychology of the human lifespan, and abnormal psychology. Students use electives to delve deeper into the field, examining social, multicultural, and/or educational psychology. One of the best online colleges for associate degrees in psychology, Sussex now offers general education courses through a 7.5-week format to promote accelerated learning. Sussex holds regional accreditation from the Middle States Commission on Higher Education. Coastline enrolls students on a campus in Fountain Valley, California. Additionally, the school holds articulation agreements with four colleges in other parts of the country, including Penn State’s World Campus. Students at Coastline can complete the school’s 60-credit AA in psychology program online and then transfer to Penn State for their junior and seniors years, earning a BA or BS in psychology. The AA at Coastline requires students to study English, math, history, and biology. Major-related curriculum of this psychology associate degree includes the option to study child growth and development, lifespan developmental psychology, social psychology, and/or the psychology of aging. Coastline boasts higher retention and graduation rates than other similar colleges. Distance learners also gain access to the library’s eBooks and databases, as well as free online tutoring from Smarthinking. Coastline holds regional accreditation from the Western Association of Schools and Colleges. Located on a 135-acre campus in Pioneer Valley, HCC enrolls about 10,000 students, many of whom plan to transfer to baccalaureate programs. This Massachusetts college offers a 60-credit AA in arts and sciences with a psychology option. The online curriculum of this program includes 36 credits of general education coursework covering topics such as composition, biology, and human anatomy and physiology. Students use 12-15 credits to examine topics in psychology, taking classes like information literacy in psychology, human development, and/or child psychology. One of the best online colleges for an associate degree in psychology, HCC provides learners with the option to study some psychology topics not often offered at the two-year level, such as sports psychology and forensic psychology. Once students earn their degrees, they can pursue a bachelor’s degree in psychology online through HCC’s partnerships with schools like Southern New Hampshire University and the University of Massachusetts Dartmouth. HCC holds regional accreditation from the New England Commission of Higher Education. Since 1970, TCC has served residents of northeastern Oklahoma. In addition to standing as the largest community college in the state, TCC also serves learners around the country through distance learning. The school’s 60-credit, online AA in psychology contains 37 credits of general education in subjects such as composition, public speaking, history, and the American federal government. Learners pursuing TCC’s associate degree in psychology online complete 15 credits of psychology courses with the option to use eight more electives to examine more topics in the field. Psychology courses cover human relations, child psychology, brain and behavior, and personality theories. Additionally, a course in industrial and organizational psychology gives learners the opportunity to examine how principles in psychological science address workplace challenges. TCC manages direct transfer agreements with several four-year colleges, including the University of Oklahoma and the University of Arkansas. TCC holds regional accreditation from the Higher Learning Commission. ARC, located in Sacramento, California, offers a comprehensive catalog of associate degrees, including an AA in psychology. The degree seamlessly transfers to baccalaureate programs at California State University (CSU) schools. The 60-credit degree plan requires completion of either CSU general education breadth requirements or the state’s Intersegmental General Education Transfer Curriculum. The major features 18 credits of coursework related to psychology, examining topics like biological psychology, human development, child psychology, and research methods in psychology. Students can also take the psychology applied to modern life course, which demonstrates the applicability of psychology in areas such as sexuality, self-understanding, the use of positive psychology for well-being, and psychological disorders and their treatment. Learners interested in on-campus activities can join Psi Beta -- a psychology club with a mission to foster psychological literacy and professional development of students at two-year colleges. One of the best online colleges for associate degrees in psychology, ARC also offers affordable tuition. ARC holds regional accreditation from the Western Association of Schools and Colleges. Delta College serves learners in California’s Central Valley by offering more than 100 programs. The school also hosts a 60-credit AA in psychology that students can complete partially online and transfer to a college in the California State University (CSU) System. Learners meet general education requirements through either the CSU general education breadth requirement or the state’s Intersegmental General Education Transfer Curriculum. Participants pursuing this psychology associate degree take 18 major-related credits, examining subjects such as personal and social psychology, abnormal psychology, and research methods in psychology. A field practicum gives learners a minimum of 80 hours of guided experience in a healthcare setting, such as a mental health or human service agency. The school offers extensive tutoring services in subjects such as math, writing, science, and allied health. Through NetTutor, learners can access free online tutoring. Delta College holds regional accreditation from the Western Association of Schools and Colleges. HCC serves the Tampa Bay area through five campuses and three satellite locations. The school’s 60-credit AA in psychology offers an online pre-major degree for participants planning to attend a four-year college. Students complete general education classes while also exploring core principles and practices in psychology. The general education core includes coursework in history, math, elementary statistics, and public speaking. Major-related classes of this online associate degree in psychology feature 24 credits of coursework covering the psychology of personal growth and developmental, abnormal, and educational psychology. The school offers tutoring services through academic success centers on all of its campuses. HCC also uses prior learning assessments to award credits for CLEP, AP, dual enrollment, military service, and/or employer training. The school administers comprehensive financial aid to online learners, including scholarships and grants. HCC holds regional accreditation from the Southern Association of Colleges and Schools Commission on Colleges. GCU -- located in Wyoming, Michigan -- has served learners for more than 80 years. The school offers more than 25 programs related to Bible study, as well as other online specializations including its 60-credit AA in psychology. This program cultivates learners' understanding of human behavior within various populations. The curriculum may also meet requirements for the first two years of a baccalaureate degree at certain four-year colleges. All programs at GCU require students to complete at least 12 credits of Bible and theology studies. The psychology associate degree also covers college writing, computers, and personal finance. Students delve into their major by studying the history of psychology, the psychology of leadership, and lifespan psychology. Unlike many associate degrees, this AA program features a capstone project. GCU is dually accredited by the Higher Learning Commission and by the Commission on Accreditation of the Association for Biblical Higher Education. Part of the State University of New York (SUNY), Cayuga County Community College provides associate degrees on two physical campuses and through a virtual campus. Cayuga Online offers several fully online and hybrid degrees, including a 62-credit AA in liberal arts and sciences/humanities and social science with a concentration in psychology. This degree requires students to take classes in the arts, English, math, and health and physical education. The 12-credit concentration for this online associate degree in psychology includes an introduction to psychology and many other topics, such as psychology of personality, abnormal psychology, and adolescent psychology. Additionally, students can use electives to study industrial psychology and/or children with exceptionalities. Online learners study in small classes and receive free academic assistance through NetTutor. Students living in districts affiliated with the college who also graduate in the top 20% of their class qualify for full-ride scholarships. Cayuga County Community College holds regional accreditation from the Middle States Commission on Higher Education. A two-year college located in Texas, Navarro operates a main campus in Corsicana and three others in Waxahachie, Midlothian, and Mexia. The school’s virtual college serves as its fifth campus, offering degrees such as a fully online AS in psychology. The program’s faculty includes members representing many different subfields of psychology. This AS track also provides learners with a well-rounded education, covering math, composition, and U.S. history. Student’s pursuing Navarro’s 60-credit associate degree in psychology online take classes in general psychology, human sexuality, and lifespan growth and development. The psychology of adjustment -- a fairly unique course -- teaches participants about the psychological processes that occur as people adjust to different personal and social environments. Students at Navarro may qualify for grants, loans, and institutional scholarships based on achievement, need, and/or other requirements. Navarro holds regional accreditation from the Southern Association of Colleges and Schools Commission on Colleges. MPC offers 14 associate degrees that can be transferred to bachelor’s programs at California State University (CSU) schools. Through MPC Online, students can pursue a growing number of online programs, including a 60-credit AA in psychology for transfer. This degree requires CSU’s general education breadth requirement, which is offered at MPC, or the state’s Intersegmental General Education Transfer Curriculum. Both general education curricula include classes in English composition, math, and history. Major-related coursework provides learners with an understanding of contemporary and historical perspectives in psychology. Students who earn an associate degree in psychology online also complete core psychology coursework that covers biological psychology and research methods in psychology. Notable electives include the psychology of women -- a course not offered at many two-year colleges. MPC holds regional accreditation from the Western Association of Schools and Colleges. Students at the Community College of Philadelphia can begin career preparation at the institution’s main campus in Philadelphia or three regional centers. The school’s 61-credit AA in psychology can be completed mostly online. Students take general education classes in English, sociology, and applied computer technology, as well as major-related coursework in adolescent psychology, psychopathology/abnormal psychology, and research methods in psychology. The program also offers a course in experimental research methods in psychology. This class examines experimental design, validity and reliability, selecting samples, and experimental design variations. As part of the course, learners read and interpret literature and learn APA’s report writing style. Learners pursuing their associate degree in psychology receive access to academic support services, including workshops and online tutoring sessions. The Community College of Philadelphia holds regional accreditation from the Middle States Commission on Higher Education. One of the largest community colleges in Michigan, LCC oversees a vast catalog of more than 200 associate and certificate programs. The school’s 60-67-credit AA in psychology pathway provides a fully online curriculum designed for transfer to a four-year program. The degree satisfies the Michigan Transfer Agreement for students, allowing them to transfer from a two-year school to a four-year institution in the state. The curriculum includes general education credits in topics such as English, math, and social science.Individuals who earn this psychology associate degree complete an introduction to psychology course and required classes in social psychology and the psychology of personality. Learners can also use elective credits to study the growing field of positive psychology and its application in real life, or many other topics, such as cognitive psychology, brain and behavior, and the psychology of death. LCC holds regional accreditation from the Higher Learning Commission. IWCC -- based in Council Bluffs, Iowa -- opened its doors more than 50 years ago and offers over 80 vocational, technical, and liberal arts programs. The school also delivers many online classes, including those in its AA in psychology program, using the Moodle learning management system. Faculty designed this 64-credit program to be transferable to four-year institutions, allowing learners to go on and earn their bachelor’s degree and pursue work at vocational rehabilitation offices and community health centers. In addition to mandatory general education coursework, participants complete basic psychology-related classes, such as developmental psychology and personality and adjustment. Learners delve deeper into the field by taking at least 12 elective credits from courses that include adolescent psychology and human sexuality. Students can begin their program in the fall, spring, or summer terms. IWCC holds regional accreditation from the Higher Learning Commision. The psychology associate degree starts with the general knowledge students need to succeed in the field. You can expect classes in general psychology, which broadly studies human behavior. Other courses include abnormal psychology, which studies mood disorders and personality traits, and the history of psychology, which studies the works of some of the field’s pioneers. Psychology encompasses many specialties, including sports psychology, forensic psychology, and clinical psychology. After students complete core courses, they delve into interest-based areas. For example, sports psychologists receive more training in medicine, such as kinesiology, due to their work with athletes. Sports psychologists can further define their specialty by choosing to only work with children. Forensics courses contain more legal terminology and communication study since professionals work in the criminal justice system and could testify in criminal cases. Individuals with an associate degree in psychology may work with adults, children and families, or in law enforcement. Your associate degree in psychology online can lead to jobs in a healthcare setting, a government environment, schools, or in private practice. General Psychology: This course provides a broad overview of psychology and often stands as a prerequisite for more advanced courses. Learners study a range of topics that include the relationship between attitudes and behavior, the most effective treatments for mental disorders, personality studies, how humans perceive consciousness, and psychological research methods. Introduction to Abnormal Behavior: Students examine behavior and personality disorders and their causes. Individuals study how psychologists diagnose mental health illnesses and the steps they take to assess these behaviors. Students learn about current diagnostic techniques and mental illness treatments. They also study how legal issues impact mental healthcare. History of Psychology: This course explores the theories of some of the greatest minds in psychology and their impact in the field, including Sigmund Freud, Carl Jung, and Wilhelm Wundt. Individuals study the advent and application of some of the field’s most prominent theories, including behaviorism, cognitive, and humanistic. With an associate in psychology degree, you can work with patients in an office setting under a psychologist’s direction. This rewarding work can also lead to other opportunities for those who decide to continue their education. Psychiatric Technician: This professional works directly with patients by listening to their concerns and monitoring their behavior. They assist patients with daily activities such as eating and also check their blood pressure and other vital signs. Individuals work with healthcare professionals and dispense medication at their direction. Social and Human Service Assistant: These individuals work under a psychologist’s direction and provide a range of services to clients. You may help clients with paperwork when applying for services and benefits, assist clients with disabilities find services, or aid veterans as they acclimate to civilian life. Earning a higher degree in psychology can yield a higher salary; this is especially true if you complete your bachelor’s degree. According to payscale.com , applicants who have earned their associate degree psychology online earn an annual average salary of $33,000–$36,000. In comparison, those with a bachelor’s degree have salaries from the mid-$50,000 and up. Payscale.com also states that completing a four-year degree gives you more extensive job opportunities. Bachelor of Arts Psychology Degree: An associate degree in psychology is a great launching board for pursuing a Bachelor of Arts degree in Psychology. Upon completion, you can pursue a master’s or enter the workplace in human resources, business, case management, or school counseling. Bachelor of Science Psychology Degree: This degree is much like the above-mentioned BA but requires more credits in science and math classes. With this degree, you can pursue a master’s or enter the workforce in management, human resources, case management, school counseling, and business. Bachelor’s Human Resources Management Degree: An associate in psychology can open the door to roles working in human resource divisions at many corporations and organizations. Learners can pursue a more specialized degree by completing a bachelor’s degree in human resource management and working as a human resources director.